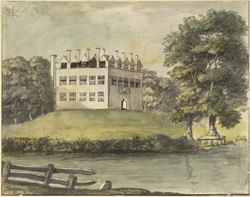 View of a mansion in Devon called Great Fulford House, 8 miles west of Exeter and the seat of Baldwin Fulford Esq.. The house was one of the most ancient in the county and the Fulford family, who had distinguished themselves in the Crusades, and had lived here since the reign of Richard I. The house itself was situated on rising ground overlooking a lake and was quadrangular with a large entrance arch decorated with the family arms.